I don’t have many food regrets. I tend to go for the gusto when it comes to eating. Many years ago, as a college senior I made a movie. I was young and needed the money. No, not really. Well, not that kind of movie. I did spend 47 hours making a documentary with a classmate on people’s musical tastes (the lengths an English Major will go to to avoid writing another $&*%# essay). We called it Taste Test. It was Oscar worthy. A work of pure genius. Really. We had opening and end credits and music by Lennon, John and Sean. We interviewed a professor in his office, a cowboy at the mall, and made some classmates look really foolish. We got a 100% on it. I didn’t even think 100%’s were allowed on college campuses. The last 12 hours of working on this magnum opus were spent at my co-director/co-producer/co-cinematographer/co-screenwriter parents’ house. We were co-editors too. We were talented. This lovely family had a number of children, all in that teen to college age range. That age that makes your fridge cringe. Friends were omnipresent chez Ammerman. There was a herd there for different reasons that day. It was like an anthill, kids were crawling all over everything. The mom was accustomed to feeding the multitudes. And that evening she made Corn Flake Chicken. I didn’t eat any. I politely refused. I have no idea why. It’s not that I wasn’t hungry. We had run out for lunch, but that was a bit early and this was a bit late. I was ravenous. Obviously, I was hungry, I wasn’t thinking clearly. I don’t think I wanted to impose or some other crazy reason. It was such a dumb move. The chicken smelled heavenly. I heard the crispy crunch when my friend bit into it, from 10 feet away. Watching her take that bite is burned into my psyche forever. 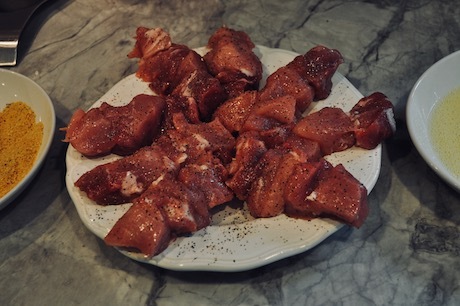 When I had the dark, tender end hunk of a pork loin in front of me after portioning the rest, it seemed right cut it in cubes, slide the chunks on a skewer, roll it in crushed Corn Flakes and pan fry it. City Chicken is a real thing, available at Ebert’s Meats on Monmouth Street. I hope you have had it before, even if it hasn’t been since you were a wee thing. City Chicken is a Depression Era recipe. During those hard times folks had backyard chickens they kept for eggs. The chicken was only used for meat when it was old and tough and only fit for stew meat. On the other side of that farmers were thinning herds of cows and pigs to drive up market price, making chicken a delicacy. City chicken is pork, lamb, or beef or a mix of them; cubed, breaded and fried to look like a drumstick. It is hard to imagine this nowadays with inexpensive cellophaned birds everywhere one looks. We are being overrun with boneless, skinless breasts (so much tastier with the skin and bones). “Please dear God, not chicken again,” was my husband’s reaction when he learned what was for dinner. Not only have the economics of the food landscape changed dramatically, but also peoples’ tastes, though perhaps if lamb were not so pricey it would at least be more tried. I don’t know many people who like lamb. 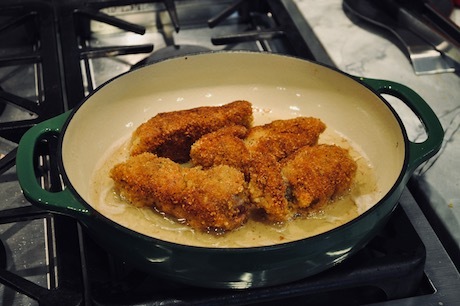 Of course, if you coat it in Corn Flakes and fry it a boneless, skinless chicken breast might even be good. The lengths people will go to for fried chicken. Here is what I did. Can’t really call it a recipe. Real chicken is next. So, have at it. Thread pork cubes on a skewer or buy them ready made. 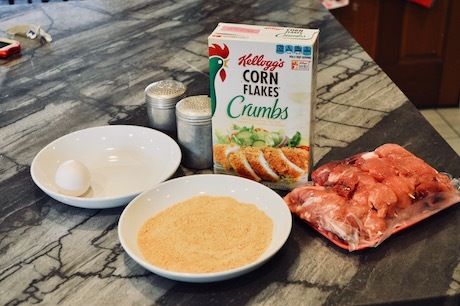 Roll in crushed Corn Flakes. Pan fry. Season generously with salt and pepper. In a shallow dish whisk egg with a couple tablespoons of water. 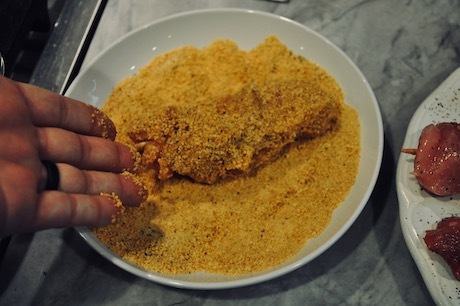 Place some Corn Flakes in another shallow dish (you can always add more if you need). Season flakes with salt and pepper. Roll skewered meat in flakes. Roll skewered meat in egg wash, let excess drip. Roll in flakes again, get ‘em in there real good this time. Load ‘em up. Pan fry in about ½ inch of hot oil, turning when a side is golden brown and the meat is cooked through. These can be finished in a hot oven too. I like to place a cooling rack on a cookie sheet to minimize the breading getting soggy. I used pre-crushed Corn Flakes when I made this for the pictures. I usually crush my own and really like the big chunks. I didn’t know pre-crushed was even a thing. They are also available at Ebert’s. Just make it. Your family will love you for it. You will love yourself for it. Make more than you think you will need. Offer it to a visitor. Don’t let them politely refuse. Just have a taste. Just a bite. Cry if you have to.